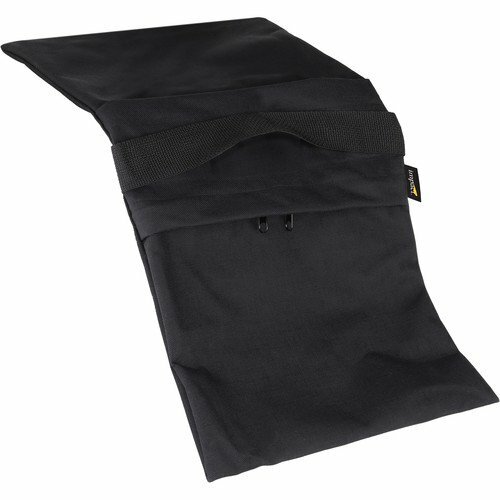 Stabilize your light stands, boom arms, backgrounds, and more with the 27 lb black Impact Empty Saddle Sandbag. Easily transport the empty saddlebag to your location where it can be filled with available sand, dirt, or rocks and securely zipped shut. When your shoot is over, simply empty the contents to make your load lighter for the commute back home. Weather- and water-resistant cordura fabric stands up to the elements and use over time, while the double-zipper design provides an extra level of security to prevent the contents from spilling. Upper and lower handles made of durable nylon webbing allow multiple options for transport and hanging as a counterweight. Weight: (Filled) 27 lb (12.2 kg)Estimated weight capacity based on use of North American sand, results may vary depending upon alternative fill material.